As a boy working in his family's cafeteria business, Joe Allbritton learned how to work with all kinds of people. Hard work created in him a sense of responsibility and drive that led him to Baylor. He thrived at the University, making lifelong friends and competing on the national championship debate team. Joe and his wife, Barbie, have built successful businesses in finance and the communications industry. And throughout their lives, they have given of themselves to numerous organizations - with Barbie currently serving on the Board of Baylor College of Medicine. 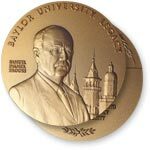 Their gifts to Baylor Law School, Moody Memorial Library, and Truett Seminary have impacted the lives of thousands of students. Art students have been given exceptional opportunities to enhance their gifts through the Allbritton Art Institute and their gift of Allbritton House, the home of Baylor Presidents, continues to serve as a beautiful retreat for University leaders. 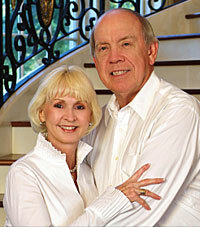 Read more about Joe & Barbara Allbritton in Baylor Magazine. Inspired by the spirit and enthusiasm he saw on the field at an early 1950s Baylor football game, Jim Hawkins gave up a football scholarship to the University of Arkansas and decided he would instead work to pay his way through Baylor.. Jim and Nell Hawkins have been avid supporters of Baylor athletics helping build the women's basketball practice facility - the result of a promise made if the women's team won the 2005 Final Four game. Of course the team won the National title and Jim and Nell say the practice facility has been one of the most gratifying of the many gifts they've given. The most recent evidence of the Hawkins' love for Baylor is a commitment to fund the Jim and Nell Hawkins Indoor Tennis Facility. Jim and Nell are also active supporters of students through scholarships and give generously of their time and resources to the Waco community. 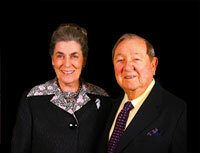 Read more about Jim & Nell Hawkins in Baylor Magazine.